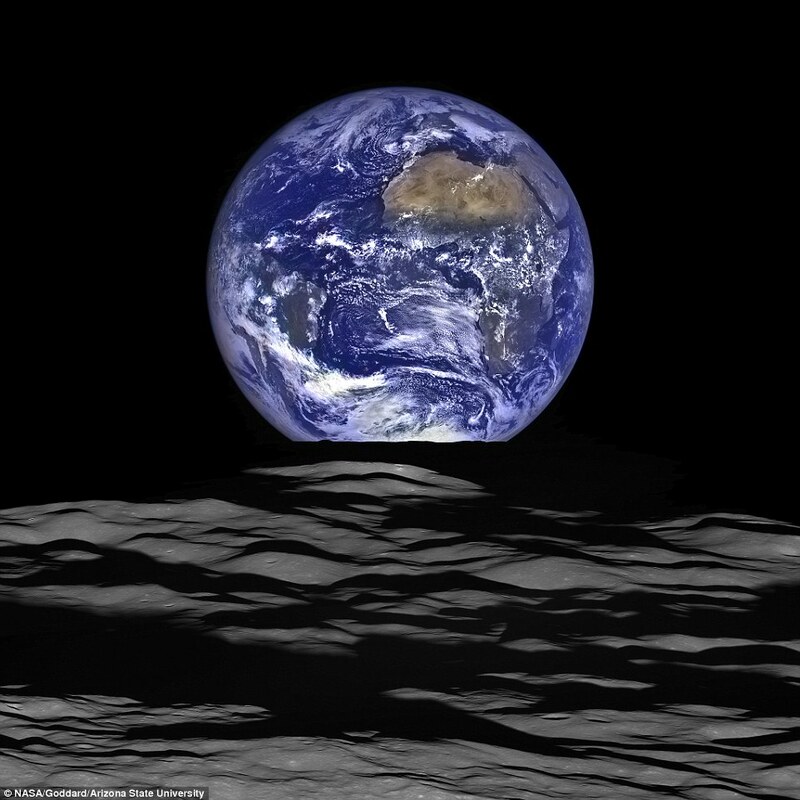 The Earth seems to rise over the lunar horizon from the vantage point of the spacecraft, with the midpoint of the Earth just off the coast of Liberia (at 4.04 degrees North, 12.44 degrees West). The big tan area in the upper right is the Sahara Desert, and just past that is Saudi Arabia. The Atlantic and Pacific coastlines of South America are observable to the left. On the moon, we get a sight of the crater Compton, which is situated just beyond the eastern limb of the moon, on the lunar far-side. The final image you see here is composed from a series of images captured on Oct. 12, when LRO was roughly 83 miles (134 kilometers) above the moon's farside crater Compton. Taking an image of the Earth and moon with LRO's Lunar Reconnaissance Orbiter Camera (LROC) device is quite a difficult task. First the spacecraft must be turned to the side (in this situation 67 degrees), then the spacecraft swings with the course of travel to maximize the width of the lunar horizon in LROC's Narrow Angle Camera image. This all takes place while LRO is roaming faster than 3,580 miles per hour (over 1,600 meters per second) relative to the lunar surface below the spacecraft.